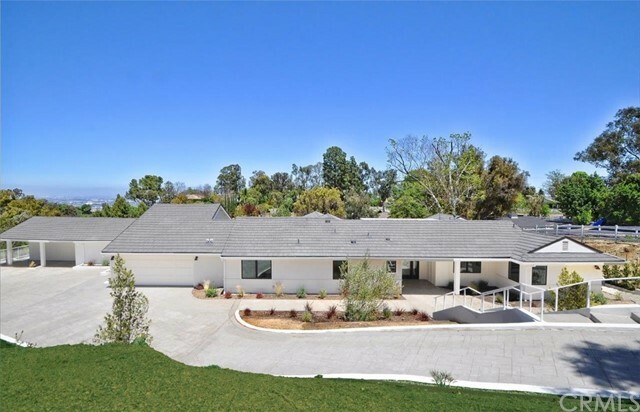 This gorgeous newer construction modern, ranch home is located in the prestigious gated city of Rolling Hills. This home was built for indoor-outdoor living, almost all living spaces extend to the outdoor decks, perfect for entertaining. This spacious open-floorplan features 4 bedrooms, 4.5 bathrooms, over 4,000 sq. ft. of living space. The heart of this home can be found in the expansive great room which includes a beautiful kitchen, dining area, and formal living room. Enjoy a more casual setting in the huge family room which includes a wet-bar and direct access to the viewing deck, set above canyon and city light views. The main bedrooms reside on the east wing, including the huge master suite with private bathroom and huge walk-in closet. Enjoy the ultimate, outdoor entertaining space on the main deck, with built-in BBQ, outdoor fireplace, covered space for dining and quick access to the great room. All of this while overlooking the sprawling grass lawn, pool, canyon and city light views. All you have to do is turn the key! © 2019. The multiple listing data appearing on this website, or contained in reports produced therefrom, is owned and copyrighted by Multi-Regional Multiple Listing Service, Inc. ("MRMLS") and is protected by all applicable copyright laws. Information provided is for viewer's personal, non-commercial use and may not be used for any purpose other than to identify prospective properties the viewer may be interested in purchasing. All listing data, including but not limited to square footage and lot size is believed to be accurate, but the listing Agent, listing Broker and MRMLS and its affiliates do not warrant or guarantee such accuracy. The viewer should independently verify the listed data prior to making any decisions based on such information by personal inspection and/or contacting a real estate professional. Listing courtesy of Gordon Inman from Keller Williams Realty . Last updated Thursday, April 18th, 2019.